Between the US-China tariff stand-off and the increasing consumer and governments’ scrutiny on sustainability issues, 2018 proved a challenging year for global sourcing. Many brands and retailers turned towards increased diversification of their sourcing in order to hedge against tariff risks and protectionist policies, while trying to maintain slow but steady improvement in supply chain ethics. In this barometer, QIMA looks at the data collected during hundreds of thousands of onsite inspections, audits and lab tests conducted during 2018. Despite a slight deceleration towards the end of the year as the tariff face-off with the US continues to unfold, China’s demand for inspections and audits showed resilience in 2018 with a +8.5% growth compared to 2017. 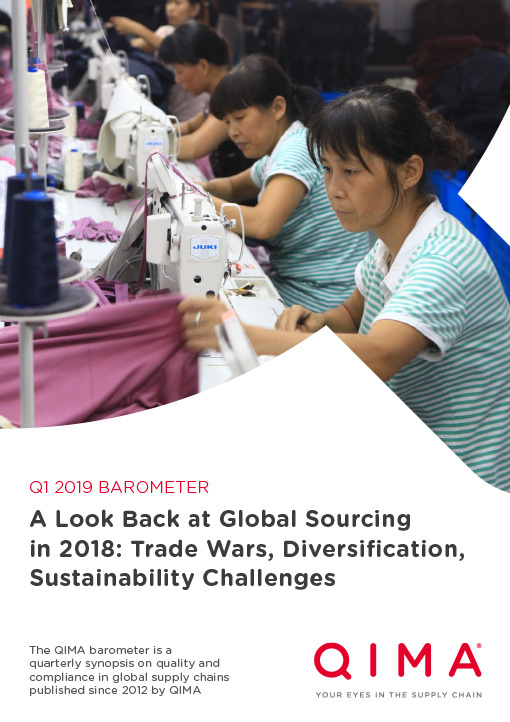 In a 2018 QIMA survey of 100+ businesses across the globe, up to 30% of respondents said they were diverting their sourcing from China to other regions, and as many as three-quarters noted they had already started sourcing suppliers in new countries, or were going to do so before the year was out: the sourcing geographical diversification is very much under way. Indeed, QIMA saw significant growth in quality control activities in different parts of Asia. 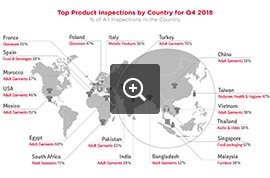 For instance, in Southeast Asia, Indonesia and Cambodia saw demand for inspections and audits expanding by over 50% in 2018. 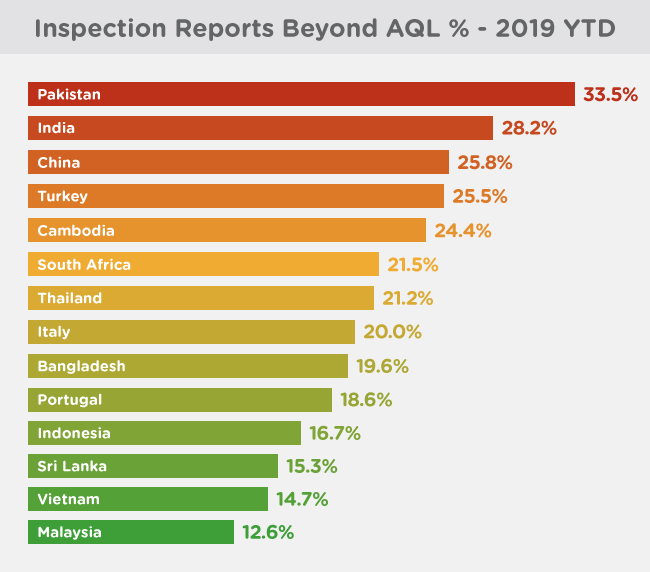 Meanwhile, demand for inspections and audits in South Asia grew double-digit, outpacing the forecast for the region’s economic growth. Bangladesh, an ever-popular destination for textile and apparel, saw a particularly strong influx of buyers, resulting in +37.3% growth. 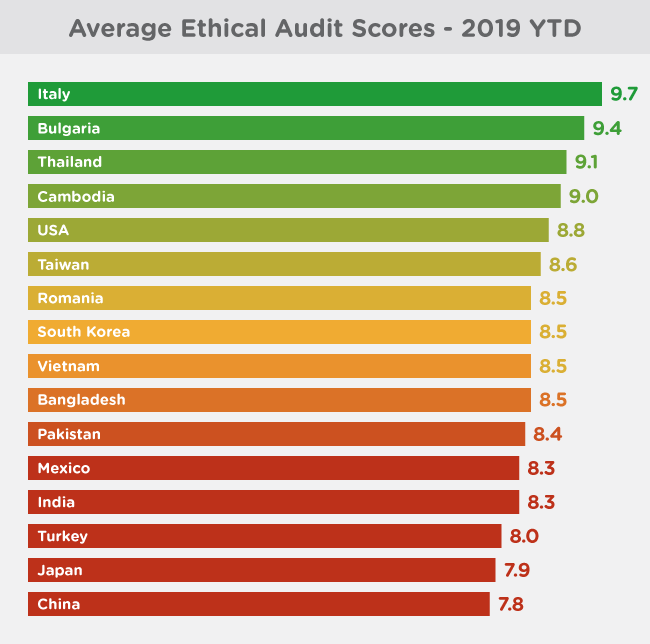 An overview of data collected by QIMA auditors during factory visits in 2018 shows that brands and manufacturers had made progress in ethical compliance, with average ethical scores rising by +4.4% in 2018 compared to 2017. The positive trend is, however, largely skewed by the good results in China, where a more mature manufacturing network consistently sees improvement in ethical compliance; when looking at other regions – the very ones where buyers are increasingly looking to diversify their sourcing – factory compliance remains an issue: Vietnam, Indonesia and Turkey saw their average factory scores deteriorate by -5.1%, -3.2% and -3.1% in 2018, respectively. In terms of individual factories, all countries combined, 24% still had critical ethical violations in 2018. QIMA audit data going as far back as 2016 shows a slow yet steady upward creep of ethical scores in the Textile and Apparel sector. That trend, coupled with the fact that this industry has received more consumer scrutiny than most, validates the argument that increased demands for transparency in supply chains result in better sourcing ethics down the line. During 2018, the most pressing ethical issues in supply chains included waste management and working hours and wages. Companies sourcing from China in particular should bear in mind the upcoming changes in the country’s social security regulations, and would do well to strengthen their audit controls in the area of supplier payroll records and employment practices. In terms of factory building safety, over 60% of audited factories require improvement in order to ensure ongoing worker safety. The state of factory safety varies greatly by region: while in Southeast Asia, just over half of all factories needed improvement in the immediate and medium term, the figure was much higher for China, with up to 70% of surveyed facilities ranked “Amber”, indicating the need for corrective action. The impacts of the increased sourcing diversification in 2018 were also reflected in product quality figures collected by QIMA during on-site inspections. In China, as manufacturers were pressured to cut costs in order to remain competitive in a tough global retail environment, their output quality took a hit: over 25% of inspected products for all industries combined were found outside of specifications, a +16% deterioration year-on-year. In other ‘hot’ sourcing regions such as Cambodia or Turkey, failure rates also increased by around 30%. 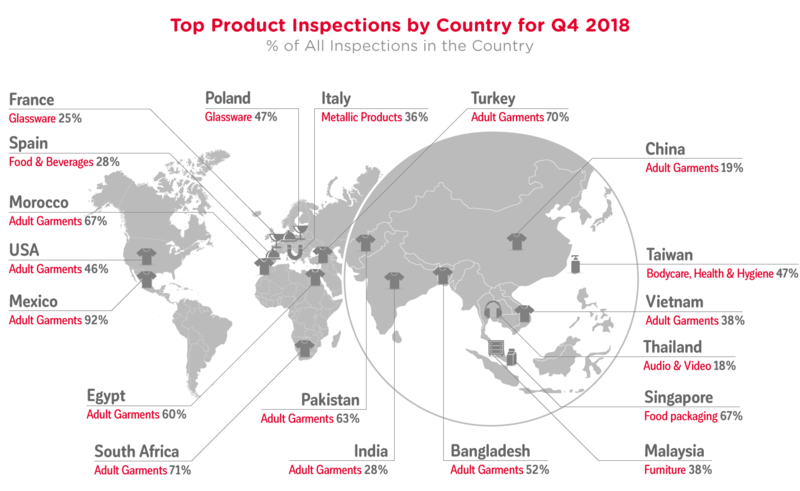 However, when looking specifically at the Textile industry, QIMA inspection data shows that manufacturers made some strides in product quality, reducing inspection failure rates by 18.5% in 2018, a possible reflection of the sector’s gradual improvement in supply chain ethics over the past two years; indeed QIMA’s data consistently shows a positive correlation between ethical scores and quality performance, with such factors as better working conditions and retention of qualified personnel contributing to higher product quality. Meanwhile, aggregated data from QIMA labs shows that phasing out lead and especially phthalates remains a considerable issue for suppliers selling to the EU and the US. Specifically, in 2018, over 7% of tested products failed to comply with EU REACH rates due to excess amounts of lead, and 8% for banned phthalates. Suppliers to the US fared better on lead, driving test failure rates under 5%, which represents a notable improvement on 2017 performance, especially in terms of compliance with US CPSIA and California Prop 65 requirements. Nevertheless, phthalate compliance among this group remained an issue, with 9% test failure rates showing no tangible improvement over a two-year period. هذا الموقع والعلامة التجارية محمي من قبل القوانين الدوليه وقوانين الولايات المتحدة الامريكية .